The UN Security Council has warned the Sudan government that it must halt atrocities by Arab militias in the western Darfur region within 30 days. A US-drafted resolution demanding that Khartoum disarm the fighters was passed with two abstentions. The vote was only passed after the US dropped the word "sanctions" and added economic and diplomatic "measures". Sudan rejected the resolution, saying it conflicted with existing agreements with the UN. "It pains Sudan to have to express its rejection of the Security Council resolution, which was a not correct one," Information Minister Al-Zahawi Ibrahim Malik said in a statement quoted by the Associated Press. He said the resolution "does not conform with the agreements signed between the government and the United Nations". According to AP, he said the government was capable of "disarming all the looting and robbing gangs", and accused the resolution of focusing on Arab militias more than humanitarian issues in Darfur. The resolution has been criticised as a "failure" by one major aid agency. 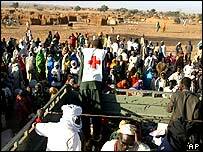 Up to 50,000 people have died and more than a million have fled their homes in Darfur. The resolution was backed by 13 council members; China and Pakistan abstained. US Ambassador John Danforth told the Council after the vote: "The government of Sudan has left us no choice. It has done the unthinkable, it has fostered an armed attack on its own civilian population, it has created a humanitarian disaster. "The responsibility for this disaster lies squarely on the government of Sudan," he said. The newly passed resolution calls on Sudan to make good on promises it made on 3 July to rein in the fighters. It has 30 days to comply. It calls for UN Secretary General Kofi Annan to issue a report also in 30 days on the progress made in each of those areas. The US removed any specific reference to sanctions in the resolution after objections from seven members - including China, Russia and Pakistan - who believe Khartoum needs more time to act. But the resolution's sponsors say the substance of the threat remains in the wording of the text. It notes that the Council "expresses its intention to consider further actions - including measures as provided for in Article 41 of the Charter of the United Nations - on the government of Sudan, in the event of non-compliance". Article 41 provides for sanctions to be applied. China and Pakistan remained dissatisfied with the wording. Explaining its abstention, China said it believed measures were unnecessary and Khartoum had been co-operating. Aid agencies, meanwhile, charge that the resolution has been fatally weakened by the changes. "The Security Council have today proved unanimous in their inaction," the representative of one major aid agency working in Darfur, which wanted to remain anonymous, told BBC News Online. 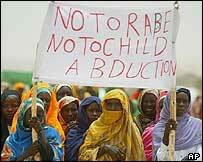 "This watered-down resolution contains no urgency and offers precious little help to the people of Darfur," he said. "The only thing the UN Security Council has delivered is... another 30 days in which civilians will continue to live in fear of being killed or raped. "While diplomats sit in New York and procrastinate, the people of Darfur are dying. The government of Sudan will be celebrating yet another failure to call them to account." Meanwhile, the World Food Programme has said it will begin a series of airdrops targeting 85,000 people in isolated regions of West Darfur in three days. Along with those who have died or have been displaced in the Darfur conflict, an estimated 2.2 million people are in urgent need of food or medical attention. Ramiro Lopes da Silva, the WFP country director, said that insecurity, heavy rain and logistical challenges were continuing to hamper the work done by humanitarian organisations. He warned that the climate of fear and intimidation still existed in Darfur. "The American ambassador has warned Sudan that the clock is ticking"